Following a volatile and lackluster 2015, global equity markets got off to a rocky start as 2016 opened. The MSCI All Country World Index (ACWI) was down by more than 11% year-to-date as of February 11 before recovering most of its losses by mid-March. By the end of the first quarter, global equities remained in modestly negative territory on a local currency basis and were modestly positive on a U.S. dollar basis. Emerging markets delivered positive performance and handily outperformed developed markets amid a still strong but weakening U.S. dollar, generally declining yields, and commodity prices that rebounded during the latter half of the period to post modest gains for the quarter. In addition to ongoing concern regarding the price of oil and other commodities, speculation surrounding the trajectory of global economic growth and central bank policy continued to fuel investor uncertainty. These issues have been front and center in investors’ minds during recent years, resulting in financial markets demonstrating a meaningful flight to quality of late. The net effect has been global risk-off sentiment where investors have sought the safe haven of the U.S. Treasury market and defensive sectors such as Utilities and Telecommunication Services, with no regard for fundamentals. Meanwhile, Financials was one of the worst performing sectors during the period due to a selloff in bank stocks. Investors who were long the sector quickly unwound their trades when the path of U.S. rate hikes was called into question and after considering how negative interest rate policies of central banks across the globe would affect banks’ net interest margins. The flight to safety during the first quarter sent global bond yields lower. This was largely driven by significantly declining developed market yields, as a number of central banks in Europe and now the Bank of Japan (BoJ) have adopted negative interest rates. Global fixed income markets (as measured by the Bank of America Merrill Lynch Global Broad Market Index) were up more than 3% on a local currency basis, and returned nearly 6% on a U.S. dollar basis. The risks in developed Europe have become more pronounced of late. Renewed banking system concerns in Italy, recent election results in certain European countries such as Spain, Portugal, and France, the threat of a British exit from the European Union, and the challenges associated with the immigration crisis and recent terrorist attacks are weighing on the region. Eurozone economic indicators show that growth remains lackluster and inflation continues to run below the European Central Bank’s (ECB) target of just under 2%. 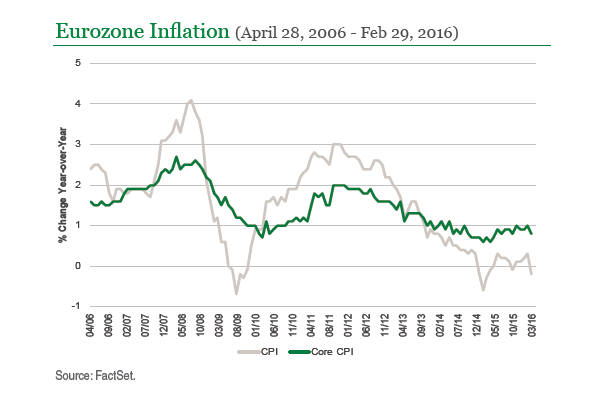 More specifically, the Consumer Price Index (CPI) dropped back into deflationary territory in February following two consecutive months of increasingly higher prices. CPI fell 0.2% on a year-over-year basis with the move largely attributable to declining transport fuel, heating oil, and gas prices. Core CPI, which excludes energy and unprocessed food prices, rose a modest 0.8% following a 1% increase the month prior. Real gross domestic product (GDP) grew at a slower pace during the October through December 2015 period for the third consecutive quarter, up just 0.27%. The 2015 figures confirm that economic growth in the region slightly slowed in the second half of the year as imports outpaced exports, likely reflecting weaker demand from China and other emerging markets. One positive from the report was the fourth quarter jump in investment spending, up 1.3% from the previous quarter. This was much stronger than the 0.4% increase recorded in the three months through September and could provide the basis for stronger growth in the future if it were sustained. In light of these latest economic developments, ECB President Mario Draghi announced a cut to the central bank’s growth and inflation forecast, as he sees risks to euro area growth remaining “tilted to the downside.” The ECB expects the economy to expand by 1.4% this year, down from 1.7% previously. Its inflation forecast was slashed to 0.1% from 1% previously. The central bank’s forecast reductions were met with a ramp up in stimulus at its March meeting, including a cut to key interest rates, 20 billion euros a month of additional bond purchases atop the current 60 billion euros, expansion of its quantitative easing program to investment-grade euro-denominated non-bank corporate bonds, and a new round of targeted longer-term refinancing operations (TLTRO II). Markets initially responded to the stimulus rollout as would be expected. Major European equity indices surged and the euro slumped. This was short lived, however. Equity markets closed the day lower and the euro closed the day higher after Mr. Draghi hinted that interest rates were unlikely to fall further due to concerns about the impact to the fragile European banking sector. We view the market’s reaction as an indication that the effect of central bank stimulus in financial markets could be waning. While central bank action certainly softened the blow of the Global Financial Crisis, it can be argued that it is now standing in the way of demand creation by having pulled future demand forward. Supply contraction is also likely being inhibited, as companies that are insolvent or near bankruptcy are able to continue borrowing at artificially low rates. Considering this latest information in aggregate we maintain our view that growth across Europe is likely to persist at a slow pace. However, we will continue to monitor for risks to our outlook. On a U.S. dollar basis, the Brazilian equity market was the best performing stock market worldwide during the first quarter, driven nearly 30% higher by an increasing likelihood that President Dilma Rousseff will be impeached on charges related to breaking budget laws. Whether or not the rally in Brazilian equities continues is in question, however, as there is very little clarity on the political path forward at this time. The run-up in Brazilian stocks is in sharp contrast to the dire state of the country’s economy. Fourth quarter data show that real GDP has contracted for seven consecutive quarters on a year-over-year basis. Household and government consumption remain weak, and investment spending has been declining at a rapid pace. The central bank began a rate hike campaign nearly three years ago to combat rising inflation, but this has done little to quell soaring prices. 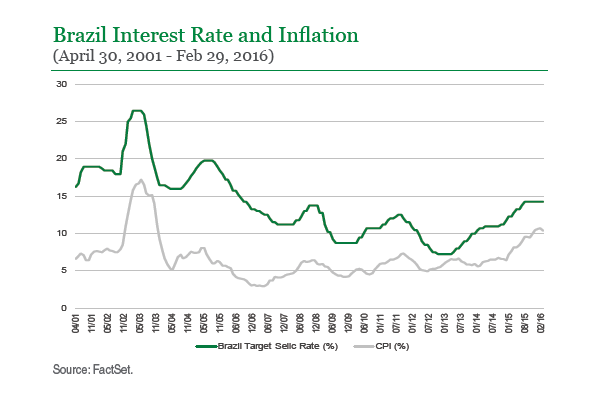 CPI has been running above 10% for four straight months, and at 14.25% Brazil already has one of the highest interest rates in the world. We are monitoring the Brazilian economy and are awaiting an inflection point. We would like to see credible reforms to mandatory spending such as pensions to improve fiscal management, more certainty regarding the political direction of the country, and stabilization in domestic economic indicators. Though some of the factors suggest that stabilization is possible, the weight of the evidence indicates more weakness for the economy ahead. For now, we are likely to maintain our investments in Brazil since our core portfolio holdings in the country are levered to secular, rather than cyclical, growth themes. As further clarity about the political situation emerges, we will continue to assess our positions. If we get a sense that there isn’t a clear successor, or that the new administration would not be up to the task of improving the environmental profile of the country, then we would likely reduce our exposure. On the other hand, a new reformist and free-market government untainted by corruption and the ongoing scandal would be a signal to consider increasing our allocation. In the meantime, we are developing a list of quality companies with exposure to Brazil so that we are ready to invest our portfolios appropriately should we become more confident about the country’s future political environment and economic path. The BoJ shocked global financial markets in January when policymakers announced the introduction of a -0.1% interest rate on certain excess reserves and said that they would “cut interest rates further into negative territory if judged as necessary.” Notably, the board was split, with the measure only passing by a narrow 5-4 vote. The BoJ’s decision comes more than a year and a half after the ECB became the first major central bank to lower interest rates below zero. 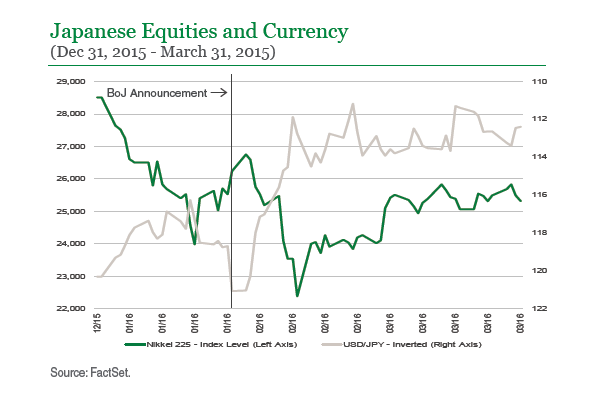 Following some post-announcement volatility, the yen strengthened significantly and the Nikkei 225 declined sharply. We view the BoJ’s decision negatively insofar as it could be taken as a signal that the central bank’s quantitative and qualitative monetary easing efforts are losing what efficacy they had in stimulating growth and driving inflation toward its 2% target. 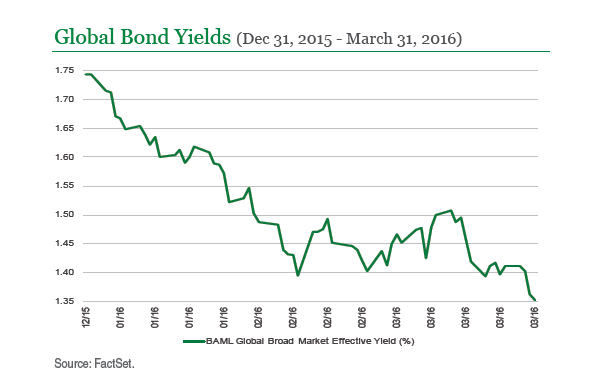 In our view, the market has shown a preference for incremental asset purchases relative to interest rate reductions. More broadly, we believe that the approach has bad repercussions for banks, money markets, and the financial system overall. It is our belief that central banks will be forced to change course and use other tools instead. Turning to the state of the Japanese economy, domestic economic indicators remain weak. Real GDP oscillated between positive and negative throughout 2015, most recently declining 0.3% during the fourth quarter from the July through September period, or -1.1% on an annualized basis. Retrenchment of household consumption continued to weigh on growth, and recent labor market indicators suggest that this is likely to continue. 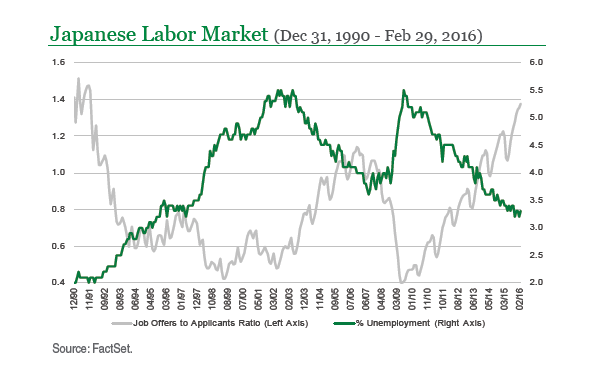 Although the Japanese labor market has tightened— the ratio of job offers to applicants is at a nearly 25-year high and the unemployment rate is near its lowest level in over two decades—the tightening has yet to translate into noteworthy wage growth. The lack of wage growth has continued despite the additional pressure that Prime Minister Shinzo Abe has directly applied to the corporate sector to boost wages. Until we see a meaningful uptick in wages, we anticipate that consumption will likely remain constrained. 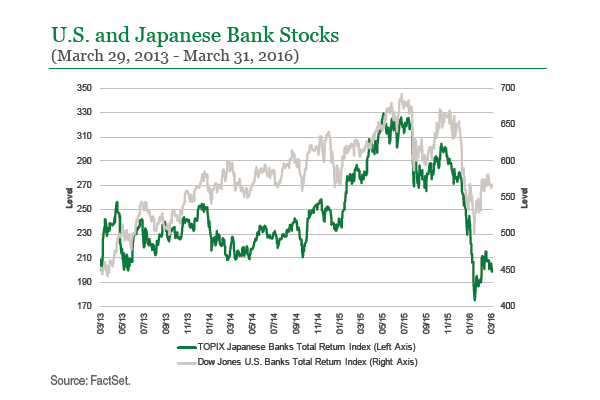 In light of these recent developments, we have become incrementally more cautious on Japan. While there may be instances of well-positioned companies trading at attractive valuations, we do not expect a durable or meaningful pickup in either growth or inflation. Additionally, the stronger yen may begin to act as a drag on corporate profits, further weighing on the economy. From an investment perspective, we will continue to be selective in our approach to Japanese equities by targeting world-class, industry-leading companies that are not levered to Japanese economic growth. Source: FactSet. Analysis: Manning & Napier Advisors, LLC (Manning & Napier). The Bank of America (BofA) Merrill Lynch Global Broad Market Index is a capitalization-weighted index that tracks the performance of publicly issued debt in the major domestic and eurobond markets, including sovereign, quasi-government, corporate, securitized and collateralized securities. The Index is rebalanced on the last calendar day of each month and only includes investment-grade securities with maturities of at least one year and a fixed coupon schedule. Index returns do not reflect any fees or expenses. The MSCI World Index is a free float-adjusted market capitalization index that is designed to measure global developed market equity performance and consists of 23 developed market country indices. The Index returns do not reflect any fees or expenses. The Index is denominated in U.S. dollars. The Index returns are net of withholding taxes. They assume daily reinvestment of net dividends thus accounting for any applicable dividend taxation. Index returns provided by Bloomberg. 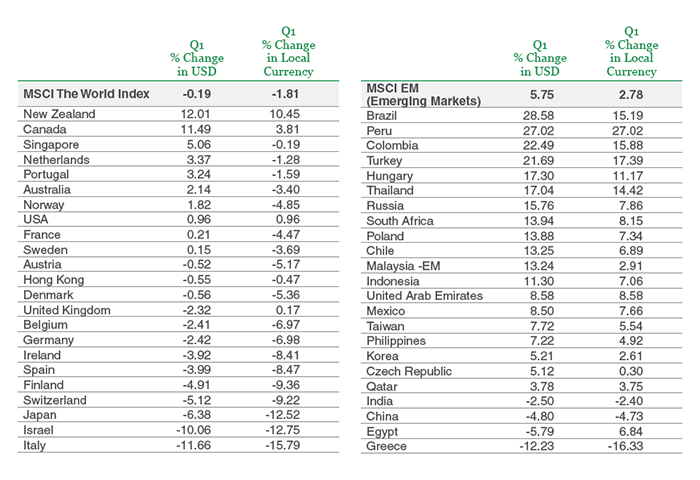 The MSCI Emerging Markets Index is a free float-adjusted market capitalization index that is designed to measure equity market performance of emerging markets and consists of 23 emerging market country indices outside the U.S. The Index returns do not reflect any fees or expenses. The Index is denominated in U.S. dollars. The Index returns are net of withholding taxes. They assume daily reinvestment of net dividends thus accounting for any applicable dividend taxation. Index returns provided by Bloomberg. All investments contain risk and may lose value. This material contains the opinions of Manning & Napier, which are subject to change based on evolving market and economic conditions. This material has been distributed for informational purposes only and should not be considered as investment advice or a recommendation of any particular security, strategy or investment product. Information contained herein has been obtained from sources believed to be reliable, but not guaranteed.